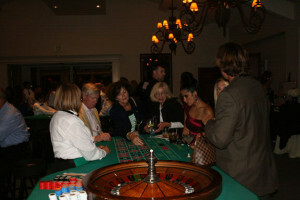 A Bridge for Kids hosted it’s first ever Casino Night at the La Jolla Country Club on Saturday night, October 12th. 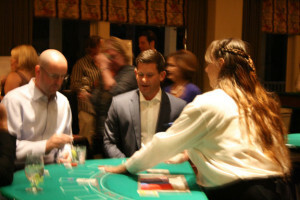 Over 150 guests gambled the night away for a great cause, raising over $110,000 for at risk teens. It was a party-like atmosphere from start to finish with Las Vegas style atmosphere at all of the black jack, craps or roulette tables. A Bridge for Kids teens were the real winners as guests placed their bets for charity. 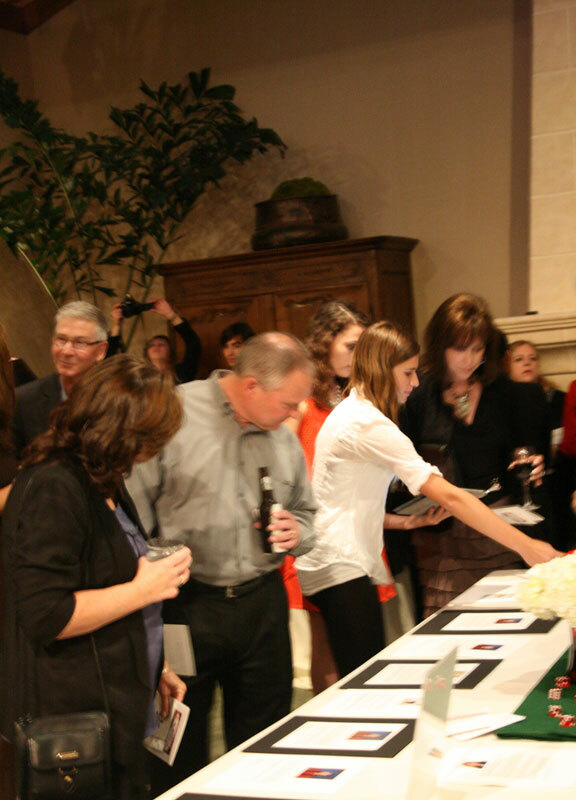 The live auction, which was packed with vacation packages to hotspots such as Las Vegas, Palm Springs, Barona Resort, Africa and The Caribbean, was one of the highlights of the night and generated in excess of $20,000 in donations. Dave and Althea Parker, from Del Mar, were the big winners of the night walking away with the 4-day Exclusive Resorts vacation with a $5000 winning bid. 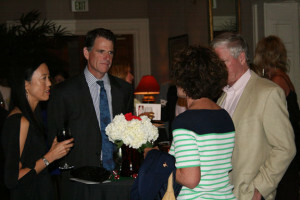 Dave and Althea Parker, the high bidders for the Exclusive Resorts vacation at the live auction. 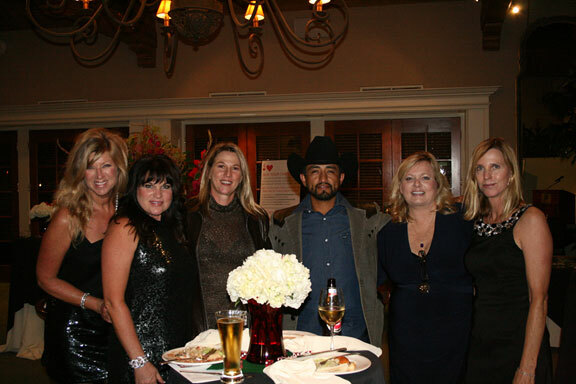 In one of the biggest (and most generous) surprises of the night, Christina and Armando from A Splash of Passion (see below) ended the live auction by announcing that they would donate a dude ranch experience with a 2-night stay at their property in Pine Valley to the highest bidder. Several couples got involved early in the bidding but it was Wendy and Jeremy McDonald who walked away with this “priceless” trip with a winning bid of $4,000. Kristi Pieper, Tammy Nance, Christina and Armando from A Splash of Passion, Amy Van Buskirk and Tracy Bennett. After all the bets were made, all the chips were won and the prizes were given away, it was clear that the real winners of the night were the teenagers that would benefit from the money raised at this year’s event. Many of their stories were highlighted throughout the evening but none more passionately then those told by Angel and Salvador. These two driven young men told their personal statements to a hushed, and sometimes tearful crowd. Their stories of overcoming significant obstacles while always moving forward were inspirational for everyone in attendance and the real highlight of the night. Amanda Nance takes a donation from Ellen Bryson who offered to pay college application fees for one of our seniors to apply to his dream schools. Thanks to the generosity of those attending Casino Night, the $110,000 we raised will go directly to help many deserving San Diego teens achieve their academic, athletic and artistic dreams. The money raised will finance items such as laptop computers, college trips, SAT and ACT preparation classes, athletic gear, summer camps, clothes, school supplies and much more. As we continue to find teens that want to better their lives and achieve success, we hope that we will be able to keep the flow of financial support going; and that Casino Night will become an annual event. If you want to become a sponsor of a teen in need or want to volunteer with A Bridge For Kids, please contact Tammy Nance at tnance@abridgeforkids.org.